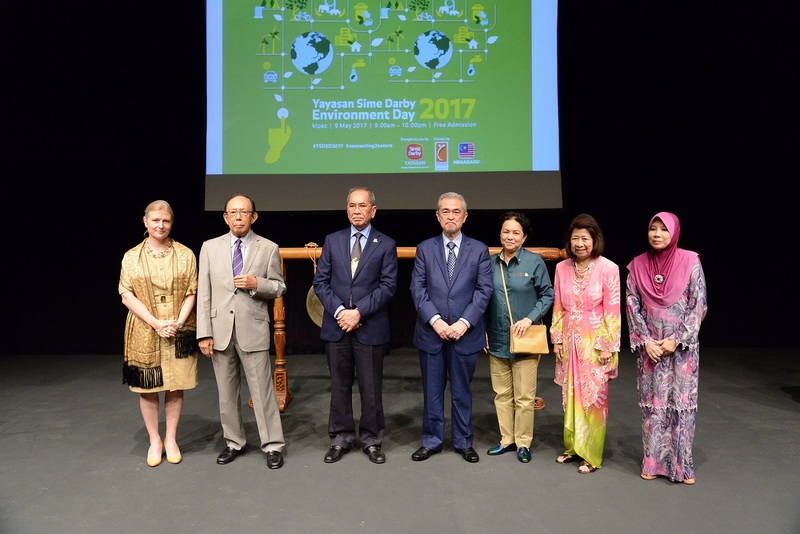 Yayasan Sime Darby (YSD) saw close to 1,500 people tread the lawns of the Kuala Lumpur Performing Arts Centre (klpac) on 9 May 2017 for the second installment of the YSD Environment Day. A total of 454 school children and 70 teachers were treated to a host of activities, exhibitions and talks at the event. In conjunction with World Environment Day, the YSD Environment Day 2017 featured 44 partner organisations which conducted 38 exhibitions, 17 workshops, 22 talks and a host of other fun activities. The theme for this year’s World Environment Day is “Connecting People to Nature” to spur individuals to explore their natural environment, learn about the importance and urgency of saving and protecting the Earth that its citizens share and appreciate the beauty of nature. And YSD Environment Day 2017 provided participants a snapshot of that. The opening ceremony was launched by Natural Resources and Environment Minister YB Dato’ Sri Dr. Haji Wan Junaidi Tuanku Jaafar and YSD Chairman YABhg. Tun Musa Hitam, who were treated to an uproarious performance by the researchers of the Management and Ecology of Malaysian Elephants (MEME) team. Also in attendance were former Prime Minister and Landskap Malaysia Patron YABhg. Tun Abdullah Ahmad Badawi, Landskap Malaysia Board of Governors member YABhg. Tun Jeanne Abdullah, YSD Governing Council Members Caroline Christine Russell and Datin Paduka Zaitoon Dato’ Othman, YSD CEO Pn. Hajjah Yatela Zainal Abidin as well as klpac Co-Founders Dato’ Faridah Merican and Joe Hasham. A new documentary series called “Borneo Jungle Diaries” produced by film production company Scubazoo was launched at the opening ceremony. The online series will feature the research conducted by one of YSD’s established partners, the Danau Girang Field Centre, on several unique and endangered species found in Sabah – such as the proboscis monkey, clouded leopard, slow loris, pangolin, pygmy elephant, long-tailed macaques and the Bornean banteng. The first episode of the documentary series will be launched online on World Environment Day on 5 June 2017, with a new episode launching every week over a period of 10 weeks. The aim of the documentary is to raise awareness and appreciation of Malaysian wildlife, the importance of conserving endangered species and the preservation of vital ecosystems. YSD Environment Day also featured contemporary dance performances by Aswara Dance Company (ADC), a long-time partner of YSD, to the delight of participants. Celebrated every year, the World Environment Day is led by the United Nations Environment Programme (UNEP). YSD Environment Day 2017 allowed participants to unplug from their daily humdrum and immerse themselves in various activities highlighting vital Malaysian ecosystems, its beauty and the life it supports. In conjunction with YSD Environment Day 2017, there were also two competitions for school children following the theme of "connecting people to nature". Secondary school students were also invited to partake in a photography competition and the winners were; Muhammad Zafreen Muhammad Zamri (first), Ahmad Hisan Abqary Muhammad Hanif (second) and Afrina Asma’ Alhannah Azhan (third). Thank you to all students for submitting and congratulations to the winners! For more photos from the event, visit our Facebook page here.